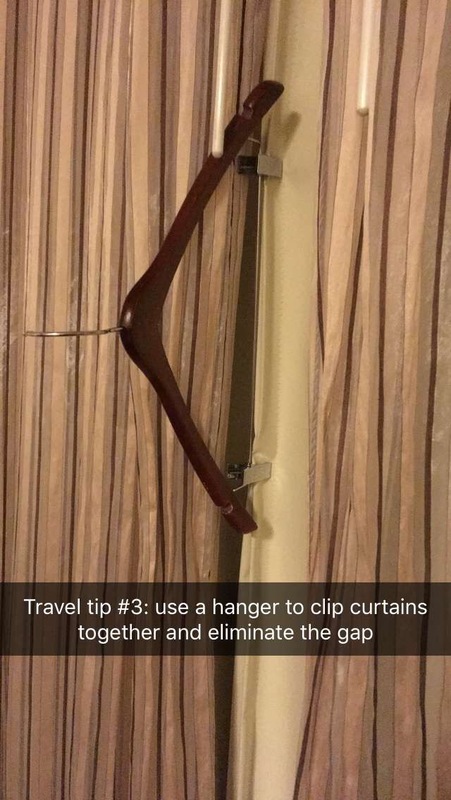 I was on a work trip last week and I posted some my favorite travel tips on Snapchat. Like most of my Snapchat stories, it was a way to entertain myself but I received a bunch of messages from friends asking for more or exclaiming “good idea!” I decided to compile them all (along with a few others) in one list. Less is more when it comes to clothes. I try to stick to two colors when travelling, especially for work. And yes, it is usually black and gray. Two colors means I usually only need two pairs of shoes versus four, two lip colors versus eight, and one set of jewelry. It also gives me the opportunity to mix and match pieces to create new outfits. Less is more when it comes to gadgets and extras. I know there are some people who prefer to bring comforts of home when they’re travelling. Not me. I try to get away with as few items as possible because I hate lugging heavy bags around the airport, into taxis, and in the hotel. Protein powder is your friend. If you’ve ever been stuck on a plane, in a long day of meetings, or had a less than stellar dinner, protein powder can help get you through those stretches without good food. My personal favorite is About Time Whey Protein because it’s got only a few ingredients, no metallic aftertaste, and mixes well with water. I use this super cool baby formula dispenser to bring four servings with me to avoid the mess of plastic baggies and scoops. Plastic bags are your friends. Despite what you may believe, plastic bags can be lifesavers on a trip. I always throw a couple of plastic bags in my suitcase for dirty laundry, wet bathing suits, or to separate my shoes from my clothes. I also have started to bring a couple of Ziploc bags because it only took one bottle of sunscreen leaking for me to learn that lesson. Plus, they come in handy when you have to buy something unexpected on the road that may leak…like rubbing alcohol to fix your cracked powder. Always keep your toiletries packed. Okay, this one may not be as much about travelling as it is packing but let’s not spilt hairs. I always have my toiletries packed because it’s one less thing to worry about as I’m rushing to pack an hour before I’m supposed to leave for the airport. I have accumulated doubles of most items, like make up brushes and phone chargers, over the years that allow me to keep everything ready to go when I need it. Store business cards in your badge holder. Anytime I’m at an event where I’m given a badge holder, I throw a few of my business cards in the back of the badge for easy access. This way, I don’t have to pause the conversation or remember exchange cards later. I also put the cards I’m given in the badge holder so I don’t have to worry about losing them throughout the day. One of the Snaps I posted during last week’s trip. Hope you find these tips helpful! Feel free to add what works for you when travelling in the comments below.